When A$AP Rocky was announced as one of the main performers at New Orleans' Buku Music & Art Project, fans were excited to witness the artist's creativity in person. However, when his show finished, some of the same people that were so stoked to see the Mob on stage were confused about what they had witnessed. "Is this even ASAP Rocky at @thebukuproject ?" tweeted one fan after he hopped off stage. "Why is asap rocky wearing a mask? Is that even him," asked somebody else. During Rocky's recent performances, he's been wearing a mask, keeping the theme of his most recent Testing project. 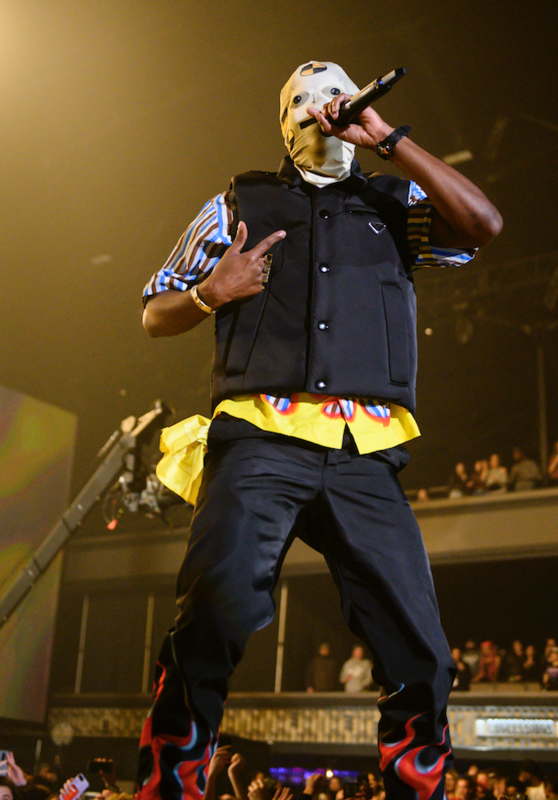 The facial accessory does hide the rapper's identity but it's mostly used to portray him as a crash test dummy, something that was used during the album's rollout. A decent number of folks was unimpressed by the performance, calling him out and accusing the star of using a stunt double at the NOLA show. It's highly unlikely that Rocky would hire a stunt double to perform his set for him. If he did, then he's got some serious explaining to do. After doing some quick research though, it's clear that Rocky was at the festival, crowd surfing during Gunna's set and literally taking his mask off at one point. Unless there's a literal clone walking around that looks and sounds exactly like the AWGE member, this rumor can easily be debunked.